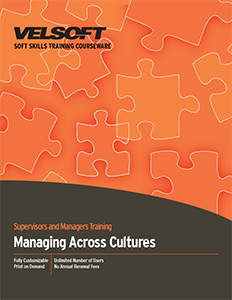 Managing Across Cultures Training Materials are designed for trainers to develop supervisors’ and managers’ ability to provide Managing Across Cultures to their employees. Teach management when Managing Across Cultures is needed, how to develop communication strategies, the six characteristics of Managing Across Cultures and more! Seeing is Believing This sample manual to teach Managing Across Cultures is in MS Word format. Give managers and supervisors a competitive edge with this one-day program on cross-cultural management. Students will develop attitudes and management skills that will help them bridge cultural differences and build winning teams. We've created an interactive, thought-provoking training package that you can purchase today and train tomorrow. You'll find an instructor's guide, handouts, PowerPoint slides, student manual, and much more. Check out a sample right now!